With the white stallion Elin’s Noncisdador, Micky Schelstraete rode to victory in the full pony team test section in Lier. With 73.238% the combination stayed ahead of the German Johanna Kullmann with Madam’s Miss Maria, they scored 72.714% and thus nestled between two Dutch combinations. Third became Pem Verbeek with Matcho D from Prinsenhofs which test resulted in 70.619%. 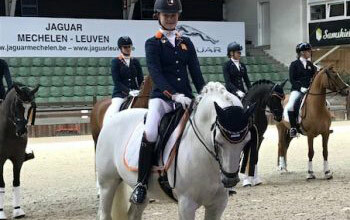 Sanne Buijs wins opening class CDI4 * Lier 2018 Jeanine van Twist 50!